These are often called True Bugs. The large, diverse family of "true bugs" contains several insects of importance to anglers, both aquatic and terrestrial (Terrestrial: Insects which live on land and are fed on by trout only when they incidentally fall into the water are known as "terrestrials" to fly anglers, and they're very important in late summer.). Perhaps the best known are the water boatmen of Corixidae, which are a primary trout food source at times in many high lakes, spring ponds, and slow-moving rivers. They are generally aquatic, although they may come out of the water to mate. I have seen good numbers of them flying over a northwoods river in late March, a sight that had me baffled until I captured one of the odd insects that kept flying past me and plunging into the water. fly fishing literature, but they probably deserve more, because they are among the largest insects native to the trout's environment. 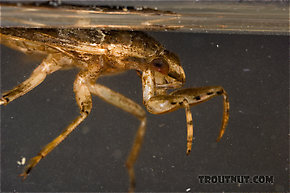 The giant water bugs of Belostoma are especially favored, but trout also feed on the water scorpions of Nepidae. I plan soon to spend more time researching and imitating these insects to confirm my hunches and early observations. The most famous terrestrial (Terrestrial: Insects which live on land and are fed on by trout only when they incidentally fall into the water are known as "terrestrials" to fly anglers, and they're very important in late summer.) members of Hemiptera are the cicadas, which make for good fishing on those rare years when a large brood appears. Late every summer some fly fishers turn to tiny related terrestrials (Terrestrial: Insects which live on land and are fed on by trout only when they incidentally fall into the water are known as "terrestrials" to fly anglers, and they're very important in late summer.) they call Jassids, which are the leaf hoppers and tree hoppers of the families Membracidae and Cicadellidae.